Immediately following a natural disaster, it is imperative to accurately assess the damages caused by the disaster for effective rescue and relief operations. Passive remote sensing imageries have been analyzed and used for over four decades for such assessments. However, they do have their limitations including inability to collect data during violent weather conditions, medium to low spatial resolution, and assessing areas and pixels on a damages/no damage basis. Recent advances in active remote sensing data collection methods can resolve some of these limitations. In this chapter, the basic theories and processing techniques of active remote sensing data is first discussed. It then provides some of the advantages and limitations of using active remote sensing data for disaster damage assessments. Finally, the chapter concludes by discussing how data from active sensors are used to assess damages from various types of natural disasters. Every year, natural hazards such as hurricanes and floods cause immediate destruction and loss of human lives and economic assets both in the United States and around the world. They also cause long-term impacts on ecological conditions and the bio‐physical environment. These impacts are a compound result of the disaster itself and existing environmental management practices, but they also shape the management of risks associated with future disasters, including the response and recovery processes. As shown by Hurricane Katrina and Asian Tsunami, post‐disaster environmental conditions often exert even more long‐lasting adverse multidimensional impacts on human welfare than the disaster itself (Dolfman & Bergman, 2007; Slattery, Willett, Cobb, & Benson, 2010). In 1995, recognizing the range and similarity between environmental and ecological problems that can be induced by disasters, the Federal Emergency Management Agency (FEMA) of the United States has adopted an all‐ hazards approach to manage and handle disasters and crisis events. The goal of this approach is not only to reduce the risk of loss of life and injuries, but also reduce the economic losses of man‐made buildings and infrastructures, and of natural environmental losses including trees and crops from all major natural hazards. To achieve this goal, the U.S. National Academies recommend that researchers as well as emergency management teams use geospatial technologies (GIS and Remote Sensing (RS)) to monitor and assess damages to the natural and built environment immediately following a disaster (Mileti, 1999). Utilizing them will not only help in saving lives but will also allow rescue and relief operations to be carried out smoothly, and societies to get back to normal. 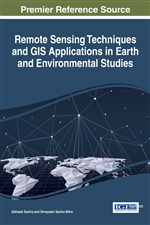 Review of literature show that remote sensing technology has been used extensively to monitor changes in the landscape (Araya & Cabral, 2010; Fichera, 2012; Hassan, Mahmud-Ul-Islam, & Rahman, 2015; Jamali & Rahman, 2016; M. T. Rahman, 2016). However, most of the optical sensors observe change (or damage) in change/no change basis. Due to the medium to large spatial resolution of these sensors, their usability is also limited when damage needs to be assessed at an individual neighborhood basis. For such cases, active remote sensing data such as Light Detection and Ranging (LiDAR) can be used to resolve some of the limitations. They have been used extensively within the last several years to create highly accurate 3D‐Maps of the features on earth’s surface. They have also been used on moving vehicles to create 360‐degrees vertical profiles of buildings, dams, levees, and other structures and assess how much damage they sustained from storms and floods (Zhou, Gong, & Guo, 2015). In this chapter, the basic theories behind active remote sensing will be first discussed. This will be followed by a discussion on the advantages and limitations of using active remote sensing technologies for disaster damage assessments. Finally, keeping the theme of the book in mind, it will conclude by providing description of how active remote sensing data and technologies can be used to assess damages from various natural disasters.